The wallet is aimed at beginners who would like to use a simple one-click desktop wallet. 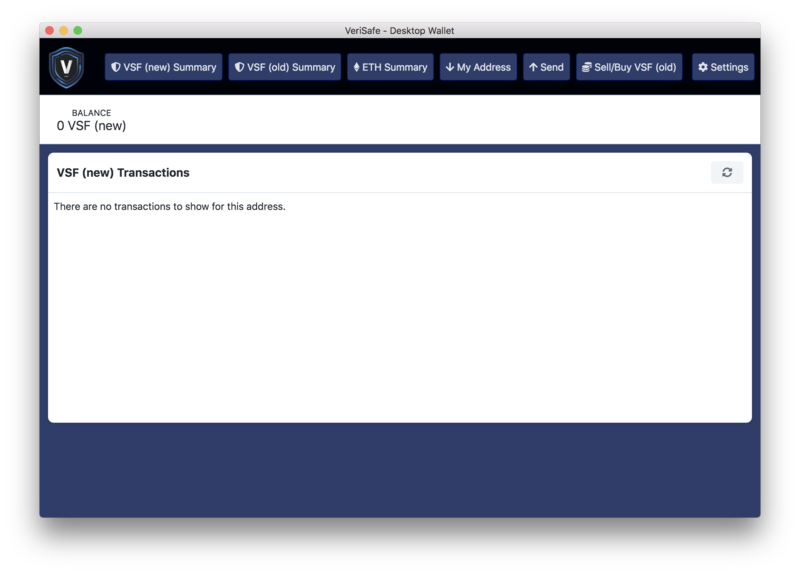 This is a VeriSafe (VSF) and Ethereum only wallet. If you have an existing installed version. Simply close the software and run the new installer to upgrade the wallet software. Always keep a secure backup of the seed used to generate the wallet. This version of the wallet interacts with the VeriSafe. Added Swap (VeriDex) - a micro one-token swap service dApp. Added price service for VeriSafe thanks to CoinGecko. Introduced Night / Light theme. Added update check function in settings. Added user checkbox to confirm that recovery seed has been saved. Fixed error in balance gets and sets. Increase Gas limits to avoid failures. The web wallet is open-sourced software licensed under the MIT license. Before you get in touch, maybe we have an answer for you already in our frequently asked questions. We will try our best to answer you personally over email, however we cannot reply to each comment. Please use our Telegram channel for support questions.